On Sale Now! 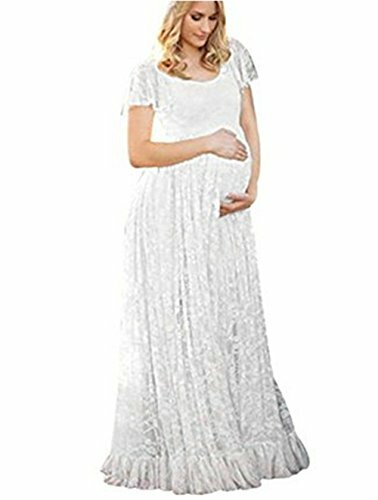 Save 5% on the U-Story Elegant Short Sleeve Lace Flutter Maternity Gown Wedding Bridesmaid Maxi Dress (X-Large, White) by ZIUMUDY at SCRHI. Hurry! Limited time offer. Offer valid only while supplies last. This gown, with a delicate sheer lace on the shoulder top and a stunning ruffled lace skirt, is sure to be a show stopper at your next event. This gown, with a delicate sheer lace on the shoulder top and a stunning ruffled lace skirt, is sure to be a show stopper at your next event. Garment Care: Hand wash only, low temperature washing, air dry. Perfect for maternity shoot, baby showers, evening party, wedding and night event. Hand wash separately, low temperature. Please double check the SIZE CHART on the left images or in the product description before purchasing to ensure accurate fitting. If you have any questions about this product by ZIUMUDY, contact us by completing and submitting the form below. If you are looking for a specif part number, please include it with your message.